So, how’s your day going? Good? Glad to hear it. Perhaps it will be improved knowing that Marines in the violent northern section of Helmand province, Afghanistan, now have tank support. The Marine Corps just released this Feb. 1 photograph of Marines in an M1A1 Abrams rolling north through the desert on the way to Forward Operating Base Edinburg, an outpost manned by 1st Battalion, 8th Marines, out of Camp Lejeune, N.C. 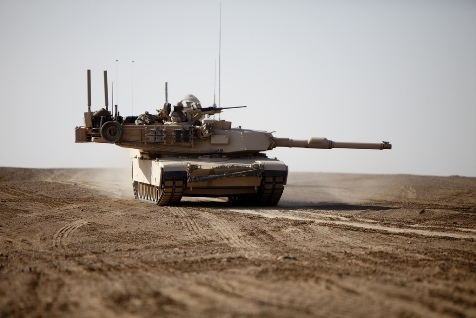 The tanks are manned by Delta Company, 1st Tank Battalion, out of Twentynine Palms, Calif., the first American unit to operate tanks in Afghanistan. Lejeune’s Combat Logistics Battalion 8 provided security and maintenance for the tank convoy, Marine officials said. A full gallery of photographs is posted here. Wonderful!!!! Now let’s send em to the Sangin Valley! Good stuff – tanks would seem like a good piece of equipment to have in a war. Keep up the good work men. We love you son! The tanks will take care of business over there~and get the job done! I’m not sure how much tanks can help in fighting the Taliban, but at least we look serious in fighting this war, even if the Obama administration does little to reinforce that notion.